Agboola, aka Baggo, reportedly killed the victim following an altercation over N20,000 which was given to them by a politician in the area. It was learnt that as Agboola wanted to collect the gift from the politician, one of his gang members, identified simply as Ahmed, hijacked it and fled. Agboola was reportedly angered by Ahmed’s conduct. A scuffle ensued between Agboola and Philip, after the latter reprimanded him for the flare-up. After being separated, Agboola allegedly led his gang members to attack the victim the following day and stabbed him to death. Sometime in April 2018, some months after the alleged murder, the suspect reportedly went to the New Gararage area, Bariga, and threatened people with a gun. The Punch was told that operatives of the Anti-Kidnapping Unit, Lagos State Police Command, went after him after the threat was reported to the police. The state Commissioner of Police, Edgal Imohimi, while parading suspected cult members and armed robbers on Monday at the command headquarters in Ikeja, said 35-year-old Agboola was arrested on May 1, 2018. He said, “In the third week of April 2018, the police received a call from an unknown person that one Lukuman Agboola, aka Baggo, a leader of the Eiye Confraternity threatened people with a gun at New Garage, Bariga. “On April 28, 2018, information filtered in that the said Baggo was sighted in the Yaba area of Lagos and we went into action immediately. Our efforts paid off on May 1, 2018, when we tracked him down on a motorcycle along Ogooluwa Street, Bariga, around 2pm. “The suspect was discovered to have caused the death of one Adegoke Philip aka Major, on August 21, 2017 in company with other deadly cult members namely: Rainbow, Aranze, Segun, aka Gbodon, Adekunle, Asumo, Ade and Agbara. The late Philip was stabbed to death by these members of the Eiye Confraternity, led by Lukuman Agboola. “Our investigation revealed that on August 20, 2017, a politician gave a gift of N20,000 to a group of cult members, including the suspect and the late Philip. Agboola wanted to receive the money from the politician, but Ahmed, one of the Eiye cult leaders, was faster and took the money from the politician. The command said Agboola’s confession led to the arrest of one Owodubi Ilesanmi, 37, on May 2, 2018, in Makoko. Ilesanmi, who was said to be one of the leaders of the Eiye cult and a close friend of the late Philip, was also allegedly involved in the murder. However, Agboola and Ilesanmi, who were said to be in police custody at the State Criminal Investigation and Intelligence Department, Yaba, were not paraded. Imohimi also said some cult members were rounded up in the Bayeku area, Igbogbo, Ikorodu, around 11pm on Friday while they wanted to initiate new members, including seven underage persons. He said a police team from the Igbogbo division swooped on the suspects after receiving a tip-off. “Three of the suspects, Lekan David, 24; Eko John, 21; and Kudus Idris, 19, confessed to belonging to the dreaded Eiye Confraternity and they were arrested while conducting initiation for newly recruited members. 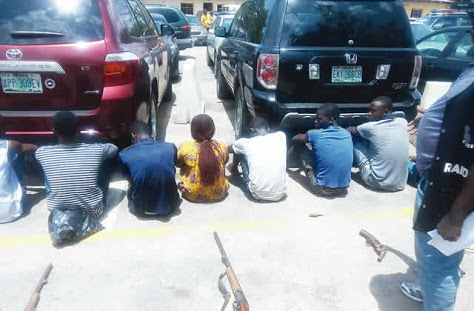 “Investigation further revealed that the suspected cult members reside on the Lagos Island and the newly recruited members were deceived that they were going for a party at Ikorodu, where they were rounded up. One worrisome thing about this arrest is that seven of the suspects are minors. “The minors will be transferred to the gender unit of the state command for diligent prosecution, while the remaining six will be charged to court,” the CP added. “An English double-barrelled gun, one cut-to-size gun, one locally-made single-barrelled pistol, one live cartridge, one Bajaj motorcycle, with the number plate AKN 386 QF, and quantities of weed suspected to be Indian hemp, were recovered from the suspects. “The suspects mentioned one Funmilola Lateef and Mohammed Abubakar as the receivers of their loot,” the CP added. But the suspects, including 28-year-old Funmilola, who hails from Ejigbo, Osun State, denied involvement in the crime. Funmilola said she was a girlfriend to one Osoko, one of the robbery suspects, who was at large.